Production of DC 704 has been discontinued. It served vacuum industry well for about 20 years. But in last 20 years technology has taken a big leap. To increase productivity Vacuum pumps need to work faster, higher level of vacuum is required by industry. Above all because of increasing competition Industry wants cost effective products. All these factors led to development of better Diffusion Pump Oils, ultimately wiping out DC 704. 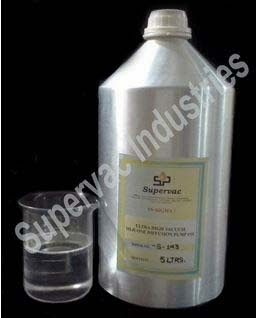 An Indian company Supervac Industries has developed such a Diffusion Pump Oil. This oil is called High Vacuum Silicone Diffusion Pump Oil : SV-SIGMA. This is next generation oil much ahead of now discontinued DC 704 in technology. Indian Vacuum Industry which is one of largest in world has been using this oil since last about 8 years. Supervac Industries also exports SV-SIGMA oil to 16 other countries. SV-SIGMA has a very long life, fast vacuum time and gives vacuum of the order of 1 x 10-8 Torr. Price is very competitive. If you are looking for an alternative to DC 704, look no further, get in touch with Supervac Industries. Anshuman Punj is a post-graduate mechanical engineer and an MBA by qualification. (B.Tech.-Mechanical Engineering, M.Tech.-Tool Design, MBA-specialization in Materials Management). He has worked at various management positions in the private sector as well as a consultant, Design for Tooling. (Eicher Goodearth, Modi Xerox and Hero Motors). This was followed by an illustrious career in the Indian Railways as a Class 1 officer. Coming across the upcoming and challenging field of vacuum deposition, Anshuman quit the government service in order to develop several ground breaking vacuum products that could be manufactured in-country. Today, he is the CEO of Supervac Industries, a highly successful Indian company that manufactures and supplies vacuum consumables to a large number of customers around the world. Anshuman Punj heads Supervac Industries which is known world-wide for its high quality and reasonably priced products. With 17 years of experience in the Vacuum Industry, he regularly writes articles and blogs on Vacuum products and applications.